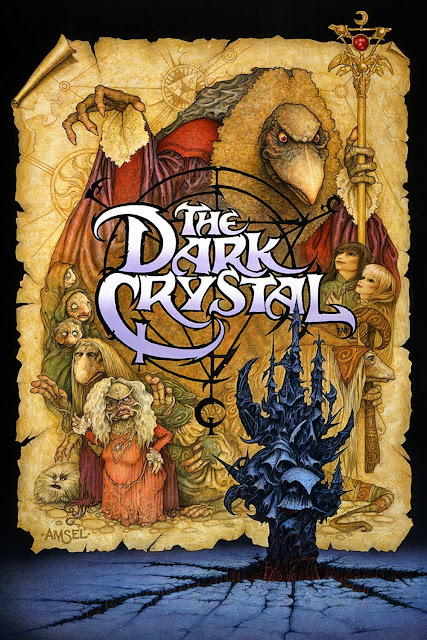 The Dark Crystal (1982) is one of my Top 100 Films ever (Top 10, actually) and it's safe to say my favorite fantasy film. It certainly scared me as a child but I love that Jim Henson (one of my heroes) wasn't afraid to go to dark places in a "family film," a quality largely lacking in today's entertainment. TDC is a fairly simple story of good and evil with a hero on a quest to save his world from darkness (with the aid of a selfless and gifted female friend). What sets it apart is the masterful handmade artistry that went into making the film. I've always appreciated the monumental effort that it must have taken to bring TDC to life. And the film stands the test of time. I realize that certain aspects of the film may appear dated and that it's not perfect, but it has the power to transcend. Every time I return to it, I am wholly absorbed in its world. The Muppets may be Henson's most recognized legacy (and we're talking about a man who gave the world so many memorable characters across TV and film), but in my eyes, The Dark Crystal is his greatest accomplishment.